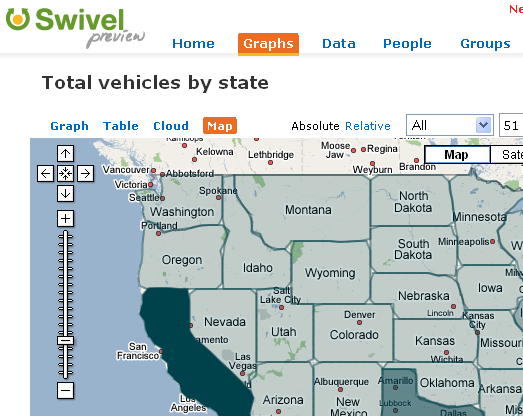 Briefly, Swivel - the community data site - has added a new geographic visualization allowing users to create maps of data. They've used Google's mapping API to render polygons. More on this later. Briefly, I've not kept up with Swivel anything like as much as I had wanted (largely due to my move out to Microsoft distracting me from many of the more in depth posts which I'm trying to complete - including one about Linguistic Agents). I failed to cover their awesome coverage in Fast Company (pdf). But I'm slightly back on the ball now. Today we are launching a new browser-based “Swivel It” button for Google Spreadsheets. The button facilitates uploading directly into Swivel, and it can be dragged-and-dropped into Firefox or Internet Explorer toolbars. Now any time that you have a Google Spreadsheet, you can click on “Swivel It” and the data will be uploaded directly to Swivel. Sara also reminded me of the graph embed capability - as demonstrated below! Note also that these graphs can be rendered in a sparkline form. However, it seems that the presentation form is determined on the server and the link is to the graph, not to the final rendered version. Thus, I can't show you both the standard view and the sparkline view as I had hoped!